We are offering Dish End Bending Services, which is widely demanded in various engineering and construction industries. Our range is renowned for various features such as corrosion resistance, high efficiency and long working life. Demands for innovative machines with advanced technology are vigorously growing in the industry. 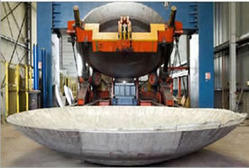 To make a bench mark in this competitive industry, Shree Ram Dishing is one of the best service providers offering all types of Hydraulic Press Works, Dish End Bending Services in the market. Located in the land of Ankeleshwar, India, we have come up to offer the best services in the industry. Our main motive is to satisfy our clients requirements, so we stress more on providing best services. Our research & development team's focal point is on the present and future development, so they are engaged in researching all the developments in the industry. We are the most prominent service provider of all types of hydraulic press work in the industry. With a huge clients appreciation in the market, we have been able to survive and create a standard for ourselves in the market. Backed with a team of enlightened professionals and their fine work, we have earned immense support and faith from our respected clients in the market. Our expert team enabled us to offer variety of hydraulic press works as per world class and clients specifications.